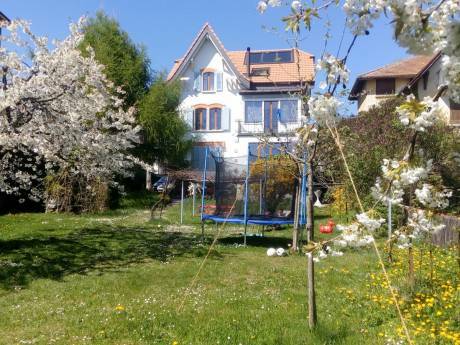 We bought the house only in October 2011, because it ideally fulfills the needs of a young family. Groundfloor: fully-equipped kitchen, open dining and living room with a open fire place and access to the terrace and garden, guestroom/study with bathroom. 1st floor: 2 good-sized kids bedrooms with their own bathroom and a parents' bedroom also with its own bathroom, balcony and sauna. Top floor: one huge room which we currently use as a &#8220;playground&#8221; for the kids. We are Nathan (48) from New Zealand, Tanja (42) from Germany, Matthias (5) and Ella (3). Nathan is a Communications Manager for a big international company in Baden and Tanja works as a book designer for a publishing house. We really enjoy living here, as we are both not from Switzerland it still feels a bit like a holiday. The absolutely central location within Europe makes travelling so convenient. 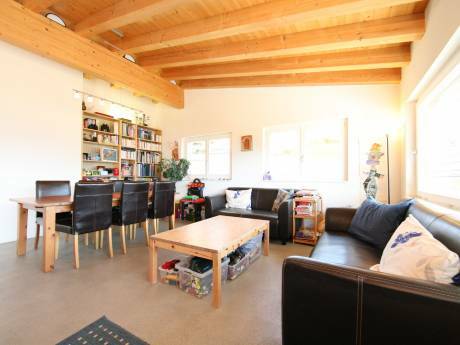 The house is located in a small village and is really close to everything. It's only 28 km and 30 minutes away from Zurich, and only 4 km away from the next bigger town, Baden, which has restaurants, supermarkets, cinemas and so on, and a buzz of its own - all you need. Public transport in Switzerland is fantastic and makes all places nationally and internationally very easily accessible. Within 1.5 hours you can be in a skifield, in 3.5 hours in Paris or in 4 hours in Munich. And From Zurich Airport a flight to towns like Barcelona, Praque, Vienna, Berlin or London is only approx. 1.5 to 2 hours away.